A big talking point of streaming, particularly of the Spotify variety has been that streaming is a solution to piracy, and that “access over ownership” models are the future. Well… ok… but that assumes that piracy (of the corporately sanctioned, ad funded variety) remains a download business, while consumers migrate to the easier more accessible (free tiered, ad funded) music streaming models. We’re told that the ad-supported free tier is the only way to attract consumers from piracy to legality. To be clear we’re not opposed to free trial periods. Free trials of 30 days, maybe even 60 days should give the consumer the ability to fully experience the value a streaming service offers. We just don’t see how the economics of ad-supported free streaming can create a sustainable revenue model for musicians and songwriters. But here’s the bigger question. What happens when the pirates migrate to streaming over storing? Now we’re back to square one. A decade ago iTunes and later Amazon provided an legal solution to piracy that was superior in every way except one, price. Why would anyone think that streaming would combat piracy any better than transactional downloads? Well, for the same reason piracy is, was and remains the primary source of music consumption, price. So the conversation and controversy over streaming is not one about the method of distribution, or technology. The conversation is the same as it has been for a over a decade, price. Essentially Spotify appears to be designed to model ad-funded piracy whereby the company who can capture the largest market share would have ability to legally devalue music by delivering it to consumers for free. 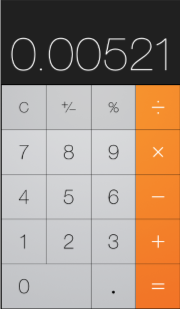 This math just doesn’t work. We can’t even see where the math on paid subscriptions will ever get to scale or revenue at a price point of $9.99 a month per subscriber. So the inevitable question becomes if streaming is the solution to piracy, what happens when piracy is streaming? There are already multiple applications that are available or in development that reportedly enable users to stream music directly from BitTorrent as opposed to the need to download files to a local hard drive. 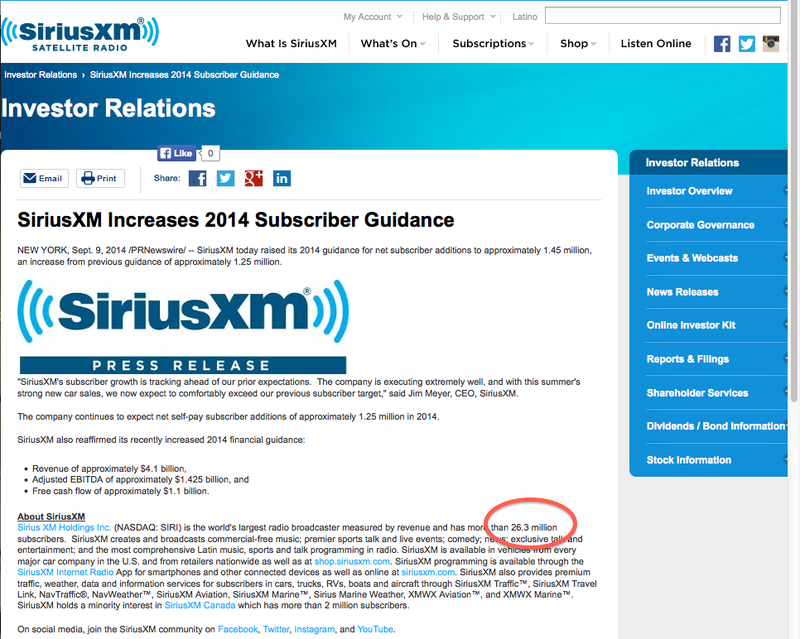 So explain to us again exactly how streaming is a solution to essentially the same service? Oh, they both need to compete on the same price point, which is free. 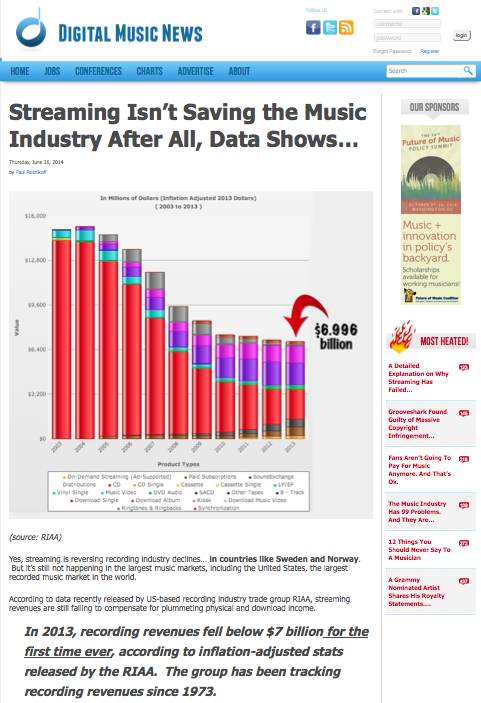 Well, guess what, ad-supported free distribution of music is not sustainable. YouTube is the largest free ad-supported free streaming distribution platform and it can not create the type of revenue required for the sustainability of the recorded music business. If we believe what they say, YouTube isn’t even a profitable business for Google! Since 2000, the number of full-time songwriters in Nashville has fallen by 80 percent, according to the Nashville Songwriters Association International. Album sales plummeted below 4 million in weekly sales in August, which marked a new low point since the industry began tracking data in 1991. Streaming services are increasing in popularity but have been unable to end the spiral. We’ve written about this before in two posts, Why Spotify is not Netflix (But Maybe It Should Be) and Streaming Is the Future, Spotify Is Not. Let’s talk Solutions. In Both posts we talk at length about how the problem is not technology or streaming itself, but rather the very restricted business models and poor economics that currently exist. No amount of selective double speak from Daniel Ek will change the bad math that Spotify can not scale at current rates. Jason Aldean now joins Taylor Swift in removing his music from Spotify which leads us to wonder how many more artists with the ability to do so will remove their new releases and/or catalogs as well. This may also be a good time to revisit those two previous posts mentioned above. So here is the question, is the record business really utilizing the new digital platforms correctly to address the current market place? Perhaps by looking at the options available to consumers from movie streaming, rental and download businesses we can find more robust and flexible opportunities for artists. At the very least windowing releases allows artists, their managers and even labels the ability to manage and maximize current revenue streams more effectively. Windowing opens up strategic decisions about tier based pricing relative to the value proposition for both the artist and the consumer. Windowing may not fix all of the problems artists are facing in music streaming but it will be a great first step towards recognizing that the artists should have some direct participation in deciding how their work is consumed. It’s not that streaming can’t work. It can. It’s that Spotify is a bad business model that has unsustainable economics and exploits artists because it is a wall street financial instrument and not a music company. Pay Gates may be another solution (which is essentially a window). For example, Spotify premium paid subscribers could access the new Taylor Swift record, but not those using the free version of the service. This also allows artists to determine which songs can be accessed for free for greater promotional value, and which songs are intended to maximize revenue. Why does Spotify unilaterally get to dictate to artists, managers and labels how to best maximize their relationships and revenues with their own fans? As Spotify is a destination platform, and not a discovery platform we could see where the current hit singles are only available to paid subscribers while select album tracks could be accessible for free. The tracks on the free tier are monetized only by advertising revenue which pays very little, but there may be a promotional benefit to build awareness on lesser know songs. Even the old school record business had tier based pricing. There were front-line, mid-line and budget pricing tiers. Front-line titles were often deeply discounted for premium in-store positioning. Mid-line titles were discounted as an incentive to stimulate more sales from recent catalog titles. Budget titles were mostly oldies and very deep back catalog. Primitive as they were, these were windows. Yes, we know the choir of “or else they’ll steal it” from piracy apologists will claim that anything less the complete devaluation of music as fodder for advertising revenue is pointless. We’ll take our chances with Jason Aldean, Taylor Swift, Adele, Coldplay, Beyonce’, The Black Keys, Thom Yorke and the growing number of artists that are either removing their catalogs from Spotify, or windowing them. Bring on the windows and pay gates! Let’s see some “innovation” and “disruption” that actually works for artists and not just the new boss. The outcry (from Spotify) of artists removing their songs also proves another very important point – all music is not equal. 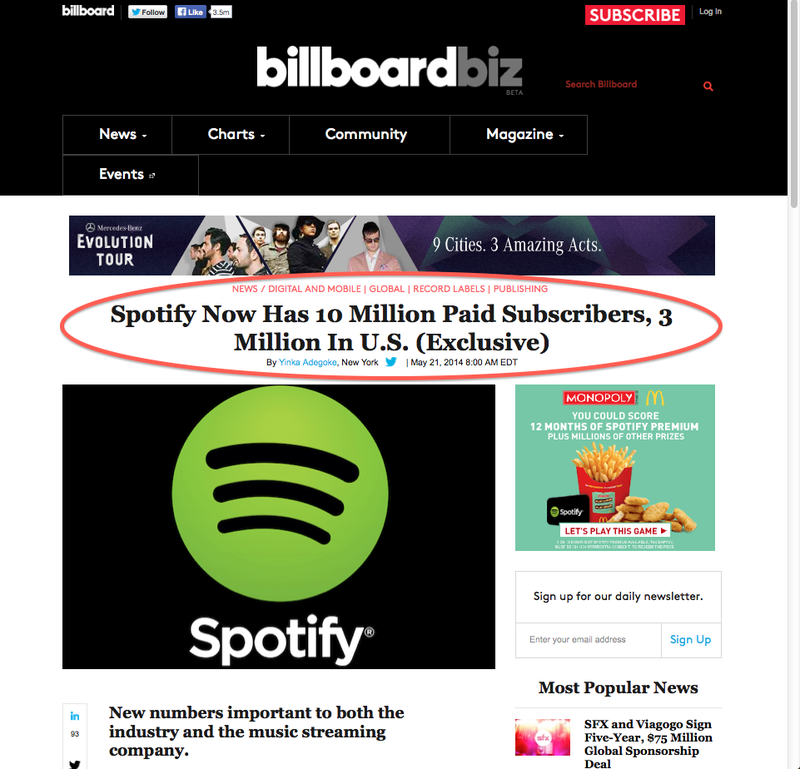 If some weekend hobbyist does not put their music on Spotify or pulls it off Spotify it doesn’t make headlines. Taylor Swift, Adele, Beyonce, The Black Keys, Thom Yorke, etc – all make headlines because people actually do VALUE professional music. Professional music, has a professional price. It’s funny how long it’s taken the record industry to realize that if you keep allowing something to be given away for free there is no incentive to pay. Who knew? The report extrapolates that YouTube Music Key will generate $400 million in revenues in its first year. 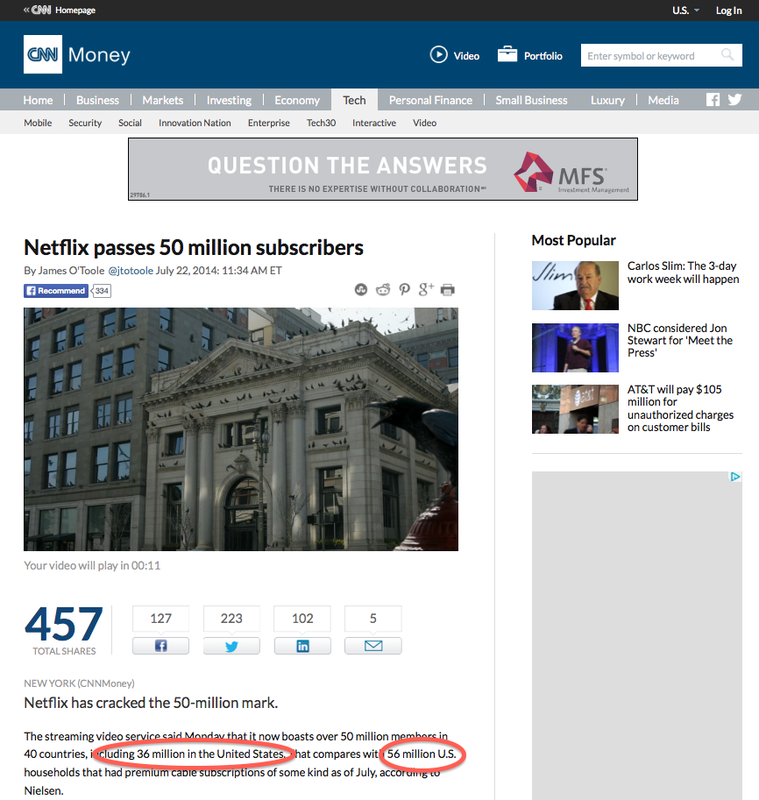 But over the long run it will also be responsible for more than $2.6 billion in lost subscription revenue yearly. That’s a negative net impact of $2.3 billion in lost music revenue every year, according to the study. To keep skinny body and maverick soul together, Iggy’s become a DJ, a car-insurance pitchman and a fashion model. If he had to live off royalties, he said, he’d have to “tend bars between sets.” As I listened to his enthusiastic stoner Midwestern drawl, I thought: If Iggy Pop can’t make it, what message does that send to all the baby Iggys out there? In a society where worth is judged by price, for better or worse, what are you saying to someone when you won’t pay for the thing he’s crafted?